A priestly elf and acolyte of Celcia who often appears during the group's adventures. 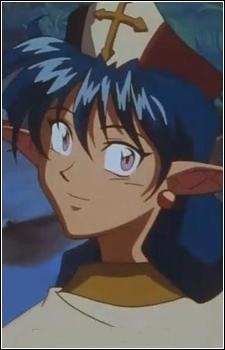 Early in the series, she loses her faith and trust in Celcia for she thought she'd betrayed the elven race for helping out Those Who Hunt Elves and sought to stop TWHE by using a powerful spell, but ended up opening a portal and bringing more earth-originated material through. Subsequently, she ended up stripped and flowing down a river attached to a log. Despite this, she is later seen as a major supporter of Elf Hunters efforts to return to Japan. Probably because this is the best way to stop them.